In the poem Williams focuses on the dancers’ bodies–their bellies and shanks in particular, and how strong the dancers must have been to prance about so lightly with such large frames. 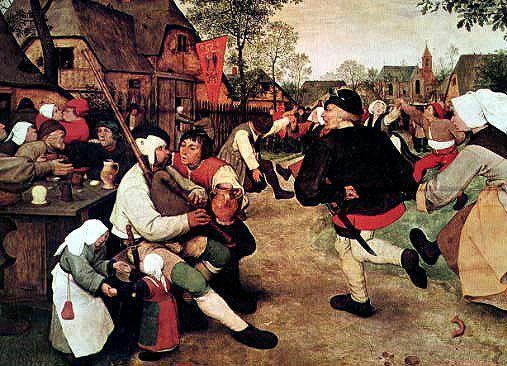 I like how Brueghel painted common folk, people who carried their own wooden spoon with them in their back pockets so they would always have a handy utensil for dining. There’s a lot to imagine in the painting, and I can see why Williams wanted to write about it. Williams often wrote about the poor, even though he was a doctor and highly educated. There’s a certain kind of mythologizing present, almost a sort of nostalgia, when someone who is not poor writes or depicts the stories or the misfortunes of others. I know many painters, filmmakers, and writers do just that. In my own poems I think of writing about social problems, but I want to be careful about not appropriating someone else’s story as my own. To avoid this spurious representation of myself as the other, I need to do what Williams did–show how I am observing and recording my thoughts and impressions. In this way there is still a need for the first person singular. Not to get too theoretical, since all I know about literary theory is what I’ve heard from grad students and the bits I’ve read on Wikipedia. There’s also an eerie documentary about Derrida that gave me a few hints.